You know how when you're craving a certain food, when you finally eat it it's so satisfying? I feel that way about NARS Night Out. It's been a good long while since I've worn a true blue on my nails and I was itching for the perfect bright cream blue that wasn't too navy or green. I've gotta say when this one came in the mail I was immediately smitten. Summertime sadness nails? Ohhh yes please! NARS just recently reformulated their polishes and I can definitely tell. Upon first layer, I was rather unhappy with how goopy and uneven the polish applied. Not wanting to be wholly disappointed, I kept on and by the second coat I noticed how the polish was smoothing itself out. I could probably have stopped there but went ahead and did my usual 3 coats for absolute polish perfection. You guys, this polish looks like I got gel nails professionally done. WOW. I used a base of OPI Nail Envy, 3 coats of NARS Night Out, and a topcoat of Seche Vite to give it that extra glossy look. One thing I did notice about this polish is that the color got darker as I wore it longer, going from this vibrant, nearly purplish blue to a more solid, blue m&m shade after the 4th day or so. I'll have to keep this in mind and see if the color change is a trend with future NARS polishes like it is with Essie polish. Readers, have you ever been pleasantly surprised by a polish you thought would apply badly but ended up nice? What is your favorite blue polish? Let me know in the comments! That's always the best feeling, when something applies badly at first but ends up so nice! My favorite true blue polishes as of now are Sally Hansen's Hard as Nails Xtreme Wear in Pacific Blue (of course!) and Revlon's Colorstay Longwear in Indigo Night! That's funny that it's getting darker. Because Gelish has also have issues with their polishes fading! I hate when polishes do that! I do love that color though, very beautiful! That is so stunning, I'm a sucker for NARS and I think I need this in my life. Damn spending ban! I've really been digging all of the different variations of cobalt/royal blue I've been seeing lately... but my favorite has to be Regal by Illamasqua. That's interesting that the polish is getting darker, hopefully it doesn't happen to the rest of the new NARS polishes. 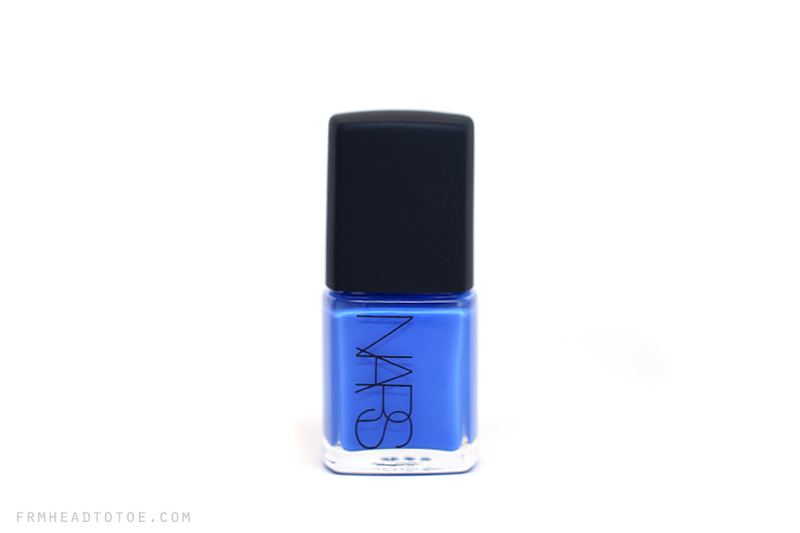 A gorgeous and rich true blue! Wow I love this colour! I am wearing a blue at the moment but this is stunning!! I love cobalt shades so striking! lovvee this blue color !! this blue color is absolutely cool!! This is such a beautiful blue colour! Would love to get something similar to this. yea, the polish darkening had also happen with the Chanel's Dragon...a beautiful neutral Red has turned into a berry red by the 5th day..
How do you get that white background behind all your pictures? It's so nice. Love this color. It's perfect for summer time! Now I want that color!